In a large skillet (I like to use a cast iron one. ), set over medium heat, add the olive oil. Allow it to heat up for a minute or two, then toss in the garlic. Cook for 30 seconds, then add the onion, and continue sautéing, for 5-7 minutes, or until the onions become translucent. Add the chicken thighs to the onion mixture, and continue cooking, allowing the thighs to start browning. After a few minutes, flip them over and allow the other side to brown, as well. While the chicken cooks, in a blender, puree the remaining ingredients, until they form a smooth sauce. Pour the sauce evenly over the chicken, and continue cooking for at 20-30 minutes, or until the chicken begins to shred easily with forks or tongs. At this point, you can shred the all of the meat, then serve it immediately. Or, after shredding, you can transfer it to a slow cooker, and keep it on the warm setting (perfect for a party). Another option is to keep it cooking on low heat on the stove top (also a great option for parties). 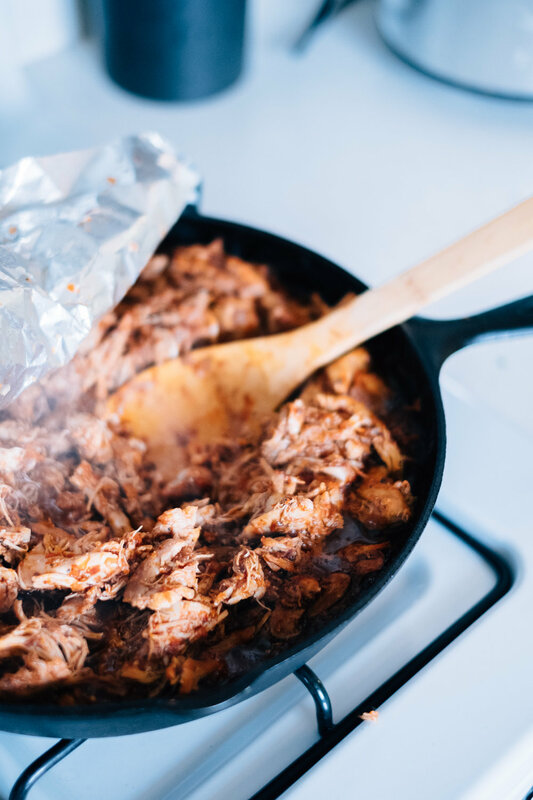 Lastly, you can cover the pan with foil, place it in the refrigerator overnight, then, the next day, place it back on a low heat burner and allow it to slowly warm up. Serve with your favorite taco shells and taco toppings, on a taco salad, in a rice bowl or to make nachos. While you can serve this right after making it, for optimal flavor, make it at least 24 hours in advance.